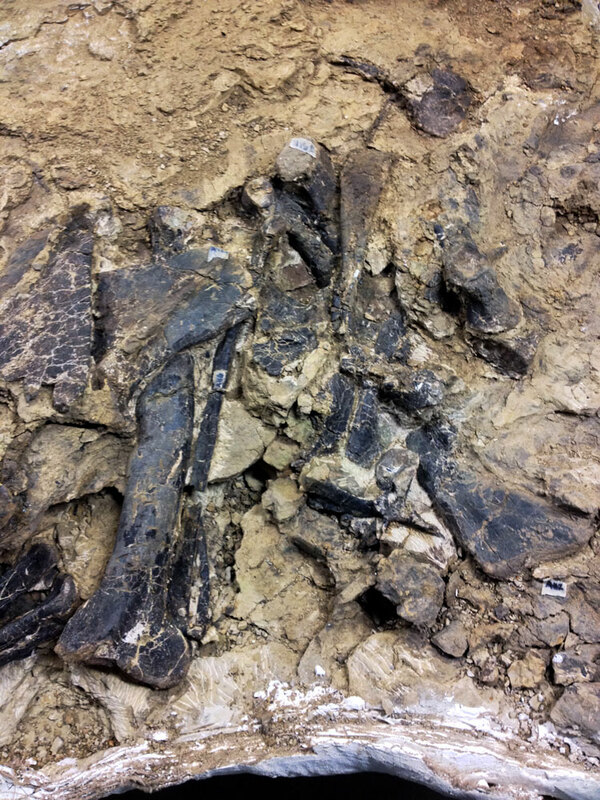 In the summer of 2013 at the Gomer Quarry at Ten Sleep, Washakie County, Wyoming, ripples of excitement ran through the digging team as they uncovered a huge, beautifully preserved theropod skeleton. After careful excavation, the team found that, hidden within the ground, there were numerous vertebrae, ribs, hips, fore and hind limbs, and most of a skull—including jaw and bearing teeth—all preserved in extraordinarily good condition. At Ten Sleep, excavations of the 150-million-year-old rocks have revealed an enormous deposit of dinosaur skeletons—documenting a mass mortality event—and have produced some of the most important Jurassic dinosaur discoveries in North America. Fragmentary bones and isolated teeth of the Allosaurus theropod are common at the Morrison Formation, so there was no mistaking that the newly found skeleton belonged to this well-known predator. However, this skeletal discovery of the Allosaurus is extra-special because it is one of approximately a dozen in museum collections associated with skull material. The excitement didn’t stop there. Later, in 2014, more fossils were uncovered: a second, smaller carnivore skeleton was found—mingled inside of the larger Allosaurus. 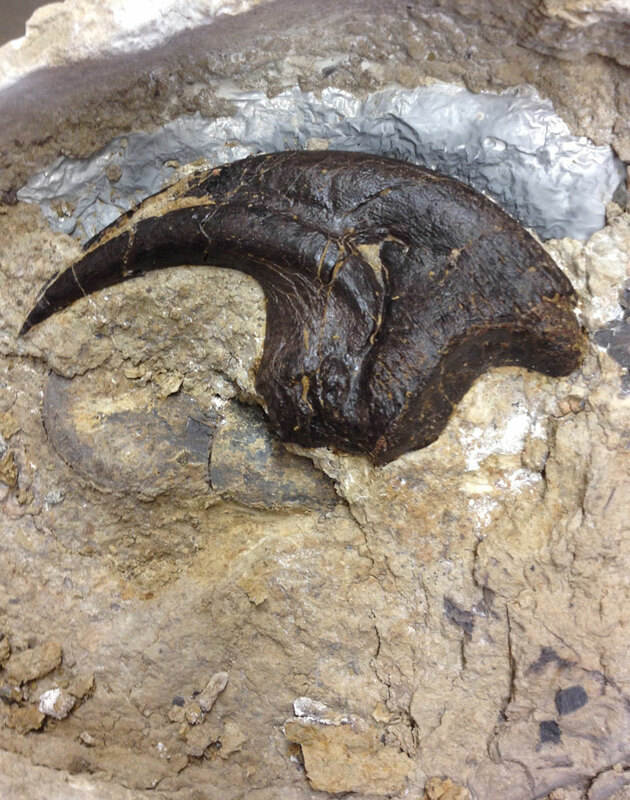 This nearly complete, 30% smaller individual is being cleaned in the lab and has yet to be positively identified. Preliminary examinations suggest this “new” carnivore may be an immature Allosaurus. If the specimens represent the same species, they offer an opportunity to study a complete osteological ontogeny, as well as possible sexual dimorphism. Alternatively, identification of such a complete, secondary carnivore would be critical in the understanding the evolution of theropods in the Morrison Formation. Speculation suggests that the site was a natural trap—for herbivorous species to perish together, perhaps during a catastrophic drought. Caught in the mud, the weak and dying would attract predators—which would likewise become trapped while feeding on these “easy pickings”. The feeding intensity is well supported by the numerous tooth sheds recovered. The more common tooth sheds belong primarily to the largest predators—Allosaurus, Ceratosaurus, and Torvosaurus—however, smaller carnivore species, e.g. Ornitholestes and Elaphrosaurus, have been identified. Moreover, preserved toothmarks, cuts, and scratches on the recovered bones further support the “natural trap” hypothesis. And because carnivorous individuals outnumbered herbivorous dinosaurs, the carnage observed is reminiscent of conditions that existed at the Rancho La Brea Tar Pits in California—where Ice Age mammals were led to their death by a rare predator-and-prey chain event. The two carnivore skeletons plan to be mounted in battling poses. Both specimens represent new and important fossils, and coupled with their unique story, they would provide an interesting and compelling exhibit that will attract visitors for generations to come. Currently there are several plaster jackets and wrapped bones being examined. The principle block containing both carnivores weighs approximately 6,000 lbs. The matrix is dense with bones lying in tangled positions and the potential for near complete skeletons is very good. Both specimens are mixed together and are either mostly semi-articulated or totally disarticulated but are closely associated in a restricted area. Exposed bone show substantial cranial, axial and appendicular elements for both individuals—see photos. The skeletons were excavated and preserved in a manner reflecting paleontological standards and include documentation in photographs, maps and field notes—all available for inspection upon request. In addition to this data, letters and legal documents attesting to the ownership of the property of the fossils are part of the complete offering.